Gold_Paper is rated 5.0 out of 5 by 6. Rated 5 out of 5 by Nonetheless from Gold paper I was very well please and so was my printing company who did my flyers on this paper. I e-mail jam paper to the people who requested you e-mail so they can order this gold paper. Rated 5 out of 5 by Auntie Rozz from Great Experiences! In looking for just the perfect paper for wedding programs for my god daughter and niece, I investigated and found just what we needed at JAM Paper. When placing my order, I was very pleased with the young lady who assisted me and her professionalism. Every experience I have encountered with any order has been outstanding. Rated 5 out of 5 by DVYW from Quality Paper Been using this paper for years. Love the product. Consistent quality. Consistent customer service from Jam Paper. Most always ship the same day and always there to assist if needed. Thank you. Rated 5 out of 5 by KimD from Nice quality paper, worked great in our printer We used this paper to create some "golden tickets" for a promotion. They turned out great and arrived to us quickly. is this white on one side? Hello! This Gold Paper is gold on both sides. Thanks for the question! Is this an 80# cover? Nevermind, I can now see it's text weight. Front and Back gold foil? Yes the gold foil is front and back. Hi would this paper be thick enough to use on a wedding invitation? I am using it as a middle layer, so I don't need to print anything on it. Just wondering how thick it is like would it crinkle easy? is it as thick as construction peper?&nbsp;Thank you. It is certainly not as thick as construction paper, but it should not crinkle easily so long as it is placed flat and neatly. There are 50 sheets to a pack. So one pack of 50 sheets cost $37.50. Thanks for the question! Can you print on this paper? If so, do you have to use an inkjet or laser? Will one or both work? Hello! Inkjet and laser printing are both possible with Translucent Vellum Paper, but it can be tough depending on the printer. Ink can smudge easily and some laser printers can warp the paper with too much heat, but your printer may be able to be adjusted to print on this paper (i.e. adjusting for lighter weight paper, different print quality modes). You can always request a sample to test it out by selecting your size and color, then clicking &quot;Request Paper Sample for Color&quot;. Thanks for the question! Is this standard weight copy paper? No it has a paper weight of 80 lb while a 'standard copy' paper has about a 20 lb weight. Yes, you can print on a laser printer. Hope this helps! Deliver your message on beautiful Gold Paper. Our Gold Printer Paper can be used to create stunning invitations, letters, announcements, greetings, menus, and more. Even use it for your résumé to impress the hiring manager! 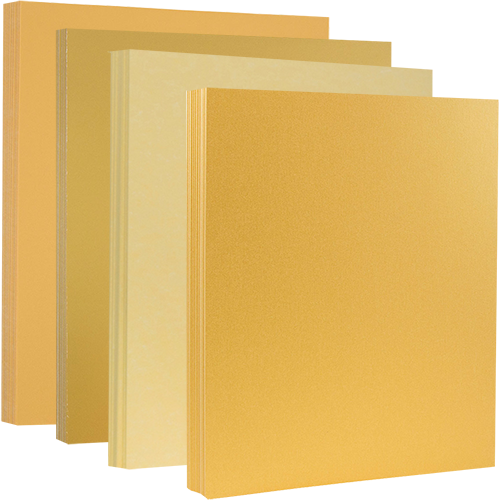 Gold Paper is available in 8.5 x 11 (standard letter size) and 8.5 x 14. All paper has a gold finish on both sides except for the Gold Foil 1-Sided Paper which is white on the other side. All gold paper and cardstock can only be used in laser printers. Available in packs of 25, 50, or 100 depending on the style, Gold Paper has infinite uses. You can even use it as your everyday stationery. As with all our products, we have no minimum order so you can order just one pack if you want. We also ship same day so you can receive your goods as soon as possible. To change the product image, select a color. Similar items can be found at the bottom of the page.